So it’s been a while since I checked out the bleeding edge dev trunk for WordPress. I spotted todays Dev Chat blog post from Jane Wells and I managed to find a few spare minutes this evening and pulled down the latest nightly build (3.4-alpha-20291 as of writing). One feature immediately jumped out of me and thought it would be of interest to you all. 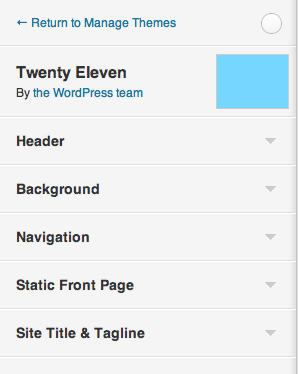 This is big big news for WordPress users and Theme Developers alike. I predict this will completely change how WordPress users go about customizing their themes and it will also have a big impact on what features theme developers implement in the very near future. It’s now quite common for theme developers to spend a lot of time building cool frontend theme customizers for their specific themes (e.g. Dandelion theme) and while that’s great – it does mean that we have a huge variance in the quality and consistency of these tools. Essentially users are having to learn a new tool each time they switch themes – in a similar way to the huge variance in quality for many Theme Options panels in WordPress themes. While the new Theme Customizer is not yet a 100% replacement for these custom tools that theme developers build, it’s a very impressive reboot of the existing preview facility. Let’s take a closer look. 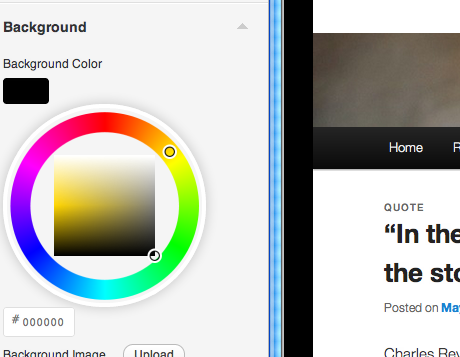 This screenshot illustrates how and end user can make body background color changes which are reflected in real time. What does mean for theme developers? I would suggest now is a good time for theme developers to check out the new theme Customizer and see how it works with your themes. While the feature still needs some refinement it represents a new direction for how we think about building themes and I would love to see how far both the dev team and theme developers can take this. Credit must go to koopersmith who has been leading the charge on this new feature – check out the Trac ticket history for more info on the evolution of Customizer. New WooCommerce theme on the way!